The world of Christian book-selling has been transformed since the Bootes family started to sell books from their family garage in Koorong Road, Marsfield, deep in Sydney’s then Bible belt. It was 40 years ago this month, when the garage door of a very ordinary suburban brick house was first raised to allow customers to walk in underneath. From that garage grew a national network of retail stores, many with cafes and children’s playgrounds, that serve as “destination shopping” outlets. Koorong is the “last man standing” among the competing Christian book chains that once stretched around the country. In other cities, similar proud names have disappeared. 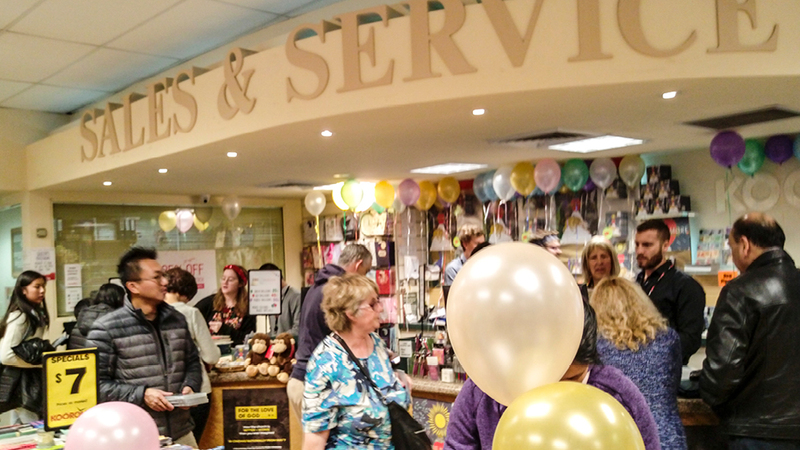 For example, Keswick Books in Melbourne and the last self-branded Bible Society bookshop in Sydney. In many ways, Koorong, with its larger stores and keen pricing, paralleled the “big box” stores that have transformed retail from Target through Bunnings to JB Hi-Fi. Koorong’s success was driven by Paul Bootes, the son of the owners of that garage who instigated a new model of book selling. 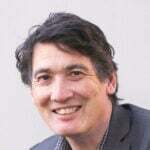 A “publisher direct” model cut out the middleman, the local distributors who arranged delivery from the large overseas publishers but who added a layer of commission: that meant that Koorong emerged as a keenly priced alternative. Some 300,000 Bibles are sold each year at Koorong, and the number has increased yearly since Bible Society bought the business. In many ways, Koorong, with its larger stores and keen pricing, paralleled the “big box” stores that have transformed retail from Target through Bunnings to JB Hi-Fi. The bookshop chain remained a family business until it was purchased by Bible Society three years ago. Today, instead of a complex web of brick and mortar competitors – although a number of independent bookstores are still supplied by Koorong – the competition comes from Amazon and other online booksellers. But a steady 75 per cent of Koorong customers prefer to visit stores rather than use the online Koorong.com – which, using the store network, can offer fast delivery. Some 300,000 Bibles are sold each year at Koorong, and the number has increased yearly since Bible Society bought the business. Koorong happened to open just as the New International Version of the Bible was published. In 1978 most Bibles fell into two camps – “essentially literal” translations such as the New American Standard Bible and the Revised Standard Bible, and “dynamic equivalent” versions such as The Good News Bible, which provided much freer phrase-for-phrase rather than word-for word-translations. The NIV was a “mediating” translation that successfully bridged the difference. Today the NIV accounts for 35 per cent of Koorong’s Bible sales and remains Australia’s best-selling translation. 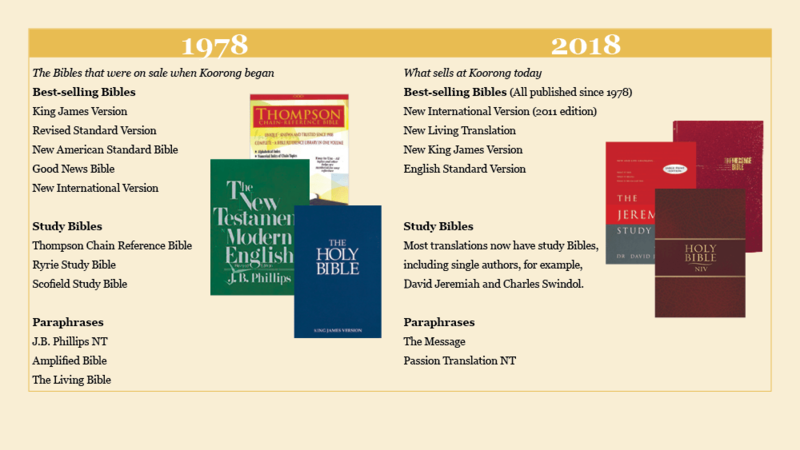 Other highlights of 40 years of the Bible recalled by Koorong staff include the NIV Study Bible in 1985, the easy-to-read Contemporary English Version (1995) and New Living translation (1996), and the “essentially literal” The English Standard Version (2001). The emergence of Koorong’s strong network of stores and the retreat of Christian titles from the general book trade has created something of a Steve Bradbury moment for Bible buyers. Koorong is the main channel for selling Bibles in Australia. It provides a Bible store in every state. Some readers of Eternity may have wondered why Bible Society bought Koorong – that network is a good reason in itself.